“This is an important demonstration resource facility now made available to Ceradrop MGI Group and our customers. Going forward, with the support of both Professor Vivek Subramania and Professor Anna Claudia Aria UC Berkeley research groups and are recognized leaders in their respective research work in physics and technology of organic semiconductors and their applications in displays, low cost electronics sensors, and actuator. It is the right needed resources for the inkjet printing electronics industry” Tim Luong, National Sales Manager for Ceradrop MGI Group. 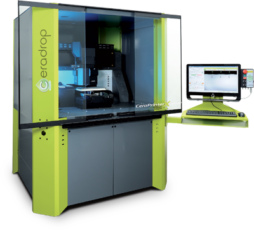 CeraPrinter equipment is a powerful tool allows to reach all types of materials deposition Inkjet processes in Printed Electronics and Smart 3D Printing. It provides high level of resolution thanks to its dynamic accuracy calibrated on the nozzle of +/- 3µm and repeatability < 1µm, whatever chosen deposition speed and printing direction. Moreover, as no manufacturer of printheads can now provide a panel of optimal heads for all inks used in Printed Electronics, the CeraPrinter equipment offers possibility to its users to work without compromise and use the most appropriate printheads of the market for each material they wish to apply (Konica Minolta, Dimatix… etc.). A large panel of heads is available from low cost cartridge to industrial printhead, with a drop volume from 1 pL up to 150 pL, number of nozzles from 16 up to several thousands, permits to apply a great variety of inks (UV, solvent, aqueous, oil, aggressive fluid). The patented system of the head-holder “plug and play” with automatic motorized rotation allows embedding simultaneously many printheads that can be quickly changed with accuracy in each of the slots of the head-holder. This head-holder is designed to advance and integrate any future printhead of the market dedicated to Printed Electronics. In addition, CeraPrinter equipment can integrate several post processes in-line (IR, UV, NIR, photonics…etc. ), in order to become a process tool “all in one” for full process development dedicated to Printed Electronics and Smart 3D Printing. About-UC-Berkeley-EECSThe UC Berkeley Department of Electrical Engineering and Computer Sciences (EECS) recently completed a new cleanroom lab at Cory Hall focused on advanced printed electronics and solution processing technologies. The EECS Department has over 120 affiliated faculty members, close to 2000 undergraduate students, and over 500 graduate students, and is the largest department at “Cal.” The distinction of the EECS faculty is evident from a long list of prestigious awards which recognize outstanding contributions in research and teaching. 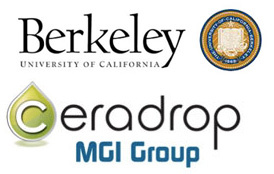 UC Berkeley undergraduate and graduate programs consistently rank in the top three nationwide in Electrical/Electronic/Communications Engineering, in Computer Engineering, and in Computer Science, attracting top researchers and students from around the world. The hallmarks of UC Berkeley success are a strong tradition of collaboration across disciplinary and organizational boundaries, dedication to education and outreach, close ties to industry, and a supportive culture.